One thing you should be concerned about is the health of your family. Unfortunately, many families face threats that are not immediately obvious. One of these can be contaminated drinking water. However, there is one safeguard you can use to ensure that your drinking water is safe for you and your family. It’s having a professional water filter installation performed in your home. There are also many other reasons why installing such a system in your Annapolis home is a good idea. Below are ten benefits of having an advanced water filtration system. 1. It will produce better tasting and smelling drinking water. If your drinking water tastes off or has some kind of discernible scent, it is probably a good idea to have an advanced water filtration system installed in your home. There are many possible sources that can affect water’s taste or smell. This includes bacterial contaminants and chemicals like chlorine. A water filtration system will remove all such bacteria and chemicals. The end result will be refreshing pure H20 that tastes clean and has no detectable smell. 2. It will remove lead. One of the biggest dangers of drinking contaminated water comes from lead. Even worse, the harmful effects of drinking lead contaminated water may not be immediately apparent. Lead can build up in the body over months or even years before the symptoms of lead poisoning become apparent. For children, the effects can be especially devastating since lead poisoning can affect a child’s ability develop both physically and mentally. In high enough doses, lead can cause death. Thankfully, an advanced water filtration system can remove this risk entirely. 3. It reduces the risk of cancer. However, if your water is properly filtered, much of this risk will be averted. Too much chlorine in your water, for example, can lead to bladder and rectal cancer. An advanced water filtration system will remove all chlorine as well as any chlorine byproducts that can pose such a risk to you and your family. 4. It can prevent gastrointestinal disease. Gastrointestinal diseases are ailments that affect the body’s ability to digest food, absorb nutrients and remove waste through the excretory system. There are things in the water that can possibly lead to such a disease. This includes giardia and cryptosporidium, two bugs that are resistant to chlorine. An advanced filter can remove both of these risks. 5. It can remove toxins from your water supply. Consuming these substances at high enough levels can lead to serious health problems. Arsenic poisoning, for example, can lead to the long-term failure of the lungs, kidney and liver. Ingesting 70 to 200 milligrams of arsenic is lethal. An advanced water filtration system in your Annapolis home can ensure that these 2,100 different toxins are not consumed by your family through your drinking water. 6. Clean water is integral for a healthy immune system. Another reason to install an advanced water filtration system is to make sure your family members have the water they need to fight off disease and keep the body healthy. For the human immune system to operate correctly, a constant supply of healthy water in required in order to manufacture the white blood cells needed to fight off bacteria and other internal threats. This is especially the case for those with weaker immune systems like children and elderly. 7. It will preserve the healthy minerals within clean drinking water. While an advanced water filter will remove toxins, bacteria and other contaminants, it will not remove the minerals within water that the body needs to remain healthy. This includes calcium. Calcium is needed for healthy bones. It is especially important for growing children as well as the elderly that suffer from degenerative bone diseases like osteoarthritis. 8. It will save you money. While it may be true that bottled water is relatively safe, it can end up hurting you in the pocket book. Bottled water is extremely overpriced compared to what most people spend on a monthly water bill. Beyond that, you will be paying your water bill regardless of whether you buy bottled water or not. With that in mind, it doesn’t make much sense if you can filter your own water to bring it up to the same exact purity levels as bottled water. 9. It helps the environment. Bottled water is also very wasteful. A lot of plastic must be created for all those bottles. This requires chemical manufacturing processes that can release a lot of pollution into the environment. Many of the chemicals used to create plastic are harmful to humans and animals. Plastic is also not biodegradable. With this in mind, if you are conscious about your impact on the environment, it is a much better idea to simply filter your water from a local source like a well or city water. One of the biggest risks of drinking unfiltered water is ingesting chlorine, which is toxic to the human body and should be avoided if possible. Removing chlorine from your water can have other benefits as well. It will result in cleaner dishes since a major source of soap scum is the chlorine present in water. It will also ensure that chlorine is not released into your air supply. It’s not good to breathe in chlorine from the air, and it can certainly affect people with allergies or breathing problems. Overall, filtered water is cheap, convenient and good for your health. There are many different ways your family could benefit from an advanced water filtration system in your home. 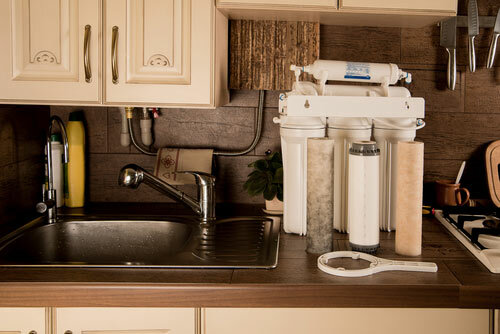 If you wish to have a water filter installation performed in the Annapolis, MD area, call the water filter professionals at Heidler, Inc. at (410) 268-7191.